← New Year – New Venture! 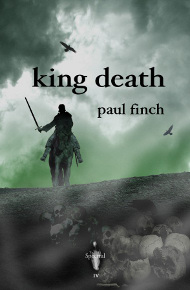 A short-crisp piece from one of my favourite authors, displaying all the hallmarks of his penmanship: rich descriptions that enliven 14th Century England and the Black Death devastating its contours, brilliant portrayals of the two characters (the mercenary Rodric and the mysterious boy), and the stage-by-stage construction of the story within a few pages. And special commendation for Spectral Press for bringing out such an exquisite chapbook. Recommended. I would encourage any readers of Spectral publications to send in their reviews to me for putting on the blog – if you have one then please send them to spectralpress[AT]gmail[DOT]com. Thanks!! Don’t forget that the Spectral/This Is Horror short story writing competition is still ongoing, where the lucky winner will get to have their winning tale published as a chapbook as well as receiving a lifetime subscription to every single publication that Spectral puts out. This is a great chance for aspiring writers to get their work out there, so get your typing fingers dancing and start writing!! Details of the competition can be found here. Or, rather, a heads-up on a blog post to be posted here on Monday about submissions to the first Spectral Christmas Ghost Story annual, to be published in early December 2012. So, if you fancy writing something seasonal to be read to an enthralled audience sitting around a roaring log fire on Christmas Eve this year, then this annual anthology might just be your thing – make a date to come back here on Monday to get all the gen on submissions to Spectral’s first short story anthology.